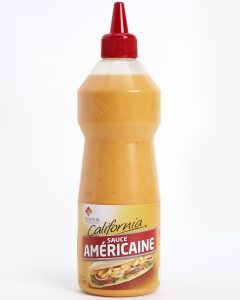 Sauce Américaine is a recipe from classic French cookery. Américaine - Treat as for Lobster Américaine. Pound shells and meat in the mortar and incorporate equal quantity of fish velouté, add butter. The recipe for Lobster Américaine includes chopped onions, tomatoes, white wine, brandy, salt, cayenne pepper and butter. As with many other classic dishes the original recipe has been adapted over time and almost every chef will prepare the sauce in a slightly different way. Modern recipes usually include tarragon, will use lobster stock rather than pounded lobster and often replace cayenne pepper with paprika.